Land-Kaart van het Eiland en de Volkplanting van Cayenne aan de Kust van Zuid-Amerika. This is a beautiful c.1760 map of the coast of French Guyana and the Island of Cayenne by Isaak Tirion. It covers from River Kourou south as far as River Kaw (Cau) and River Orapu. 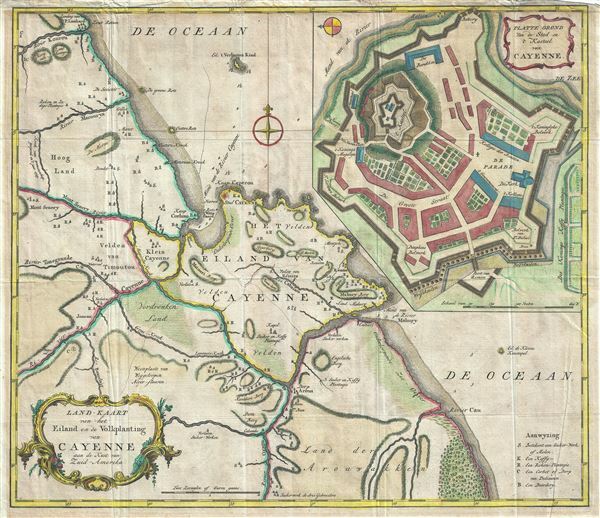 A large inset in the upper right quadrant features the fortifications of Cayenne, including Fort Ceperou. Throughout, the map notes rivers, important towns, landmarks coastal features and beautifully rendered topography. The region was first discovered by Spanish explorers and colonized by the French first in 1604 and again in 1643. Over the years, the region changed hands between the French, Dutch, Portuguese and English and would eventually become an overseas department and region of France. Fort Ceperou was built in 1643 by the New Company of Rouen led by Charles Poncet de Bretigny over land bought from the Galibis people living in the region. Named after the Indian Galibis leader Ceperou, the fort quickly gained strategic importance and the city of Cayenne grew around it. Today the site is a restricted military zone and all that remains are some walls and a bell tower. Beautiful title cartouches adorn the top right and bottom left of the map. Created by Isaak Tirion in 1760. Isaak Tirion (1705 - 1765) was a Dutch publisher in Amsterdam. Born in Utrecht, Tirion quickly rose to prominence by publishing pamphlets, historical works, and most importantly, maps and atlases. He produced several atlases and Dutch town plans. His maps are mainly based on those of Guillaume de l'Isle. Tirion eventually relocated his printing house to the prestigious Kalverstraat. In his long career, he produced eight atlases in multiple editions, some of which were published posthumously until about 1784. Very good. Overall age toning. Minor wear along original fold lines with some creasing and verso repair along margins.